Is Your Website Suited and Booted? Is your website all suited and booted? Does it look professional, in a corporate kind of way? Does it demonstrate you’re a responsible expert who knows what they’re talking about? You might think these are hallmarks of a professional business website but on reflection, are suits and boots really a true reflection of you? If you’re in alignment with your business, your passion will be easy to spot. Your essence will be in every corner of your brand. You’ll share your mission with gusto, and web visitors will understand how you can support them without having to work it out. More importantly, however, they’ll also feel like they know a little about you too. And that’s what makes you and your business attractive to potential buyers. If you’ve got a corporate background, I know it can be difficult to shake off the ‘professional’ hangover that’s all about smart black dresses, or conforming-coloured suits, because I’ve been there. I wanted my first website to look professional (after all, I was in the market for high-end, corporate clients) and show my expertise in a way that would connect with the corporate crowd. As a result, my first website lacked heart and felt soul-less. It blended in amongst the other vanilla websites in my industry, and made very little difference to my business. Luckily, after a little research, I discovered the missing ingredient – me! And I gave my online presence, my website and my social media platforms, a good old injection of Naomi, and everything started to fall into place. Content became much easier to write. It felt right, not forced. I replaced the corporate look with colour, and balloons, and genuine smiles, and my interactions grew quickly. Why? Because people want to work with people. They want to give their money to people they like and have a connection with. They want to get to know someone before they’re prepared to trust them with an important task, or purchase one of their high-end products. Be human – add some pictures of yourself to your website so people can put a face to a name, and make that all-important initial connection. Talk to your visitors – videos are fab additions to any website and if you use them to answer questions, address pain points, and share good news, people will warm to you and decide quickly if you’re a good fit for them. Share stories – whether they’re success stories from your clients, or they’re about your journey as an entrepreneur, or they’re case studies where you’ve turned someone else’s life/business around for them, storytelling is a fab way to make you stand out from the competition. Encourage them to join in – have you got a comments box at the end of your blog for people to start conversations with you / leave feedback? Get your clients on board – testimonials reveal so much about people: not only the kind of results potential clients can expect from working with you, but also what it’s like to work with you/spend time on a project with you. Speak in ‘human’ language – if your website is full of techno-babble, jargon, and keyword stuffing, then people won’t last 30 seconds on your home page. Use real language instead, pretend you’re having a conversation with one person, and the whole feel of your website will change to one which reflects you. Take a look at your website today and see if you need a fresh injection of you on there. If you’d like some help you know where I am. 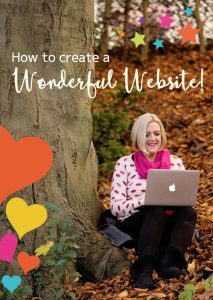 The Wonderful Website Guide Enter your details below to claim your free copy!